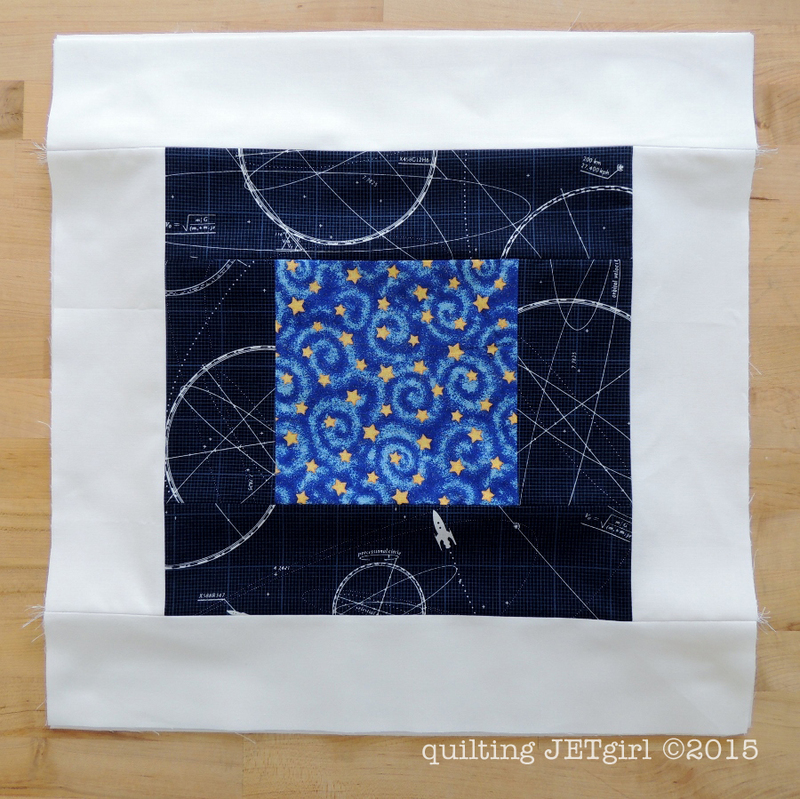 Cheryl @Meadow Mist Designs released the October instructions for the Midnight Mystery Quilt last Thursday. The directions are to make 9 courthouse step blocks. Once again, I really enjoyed making these blocks because they combine 3 of the fabrics for the quilt and I am really happy with how they look together. The blocks are really large (19-inches square), and I am curious if we are going to use them as is or if we will end up cutting them up, or… yeah, the temptation to play with the blocks that have been made and guess at the layout is strong! Linking up to WiP Wednesday and Let’s Bee Social. Your blocks are great! So appropriate for the Jetgirl 😉 I’m enjoying Midnight Mystery as well, the blocks are basic and relaxing to do which gives me lots of time to admire everyone else’s creations. So many lovely fabric choices! 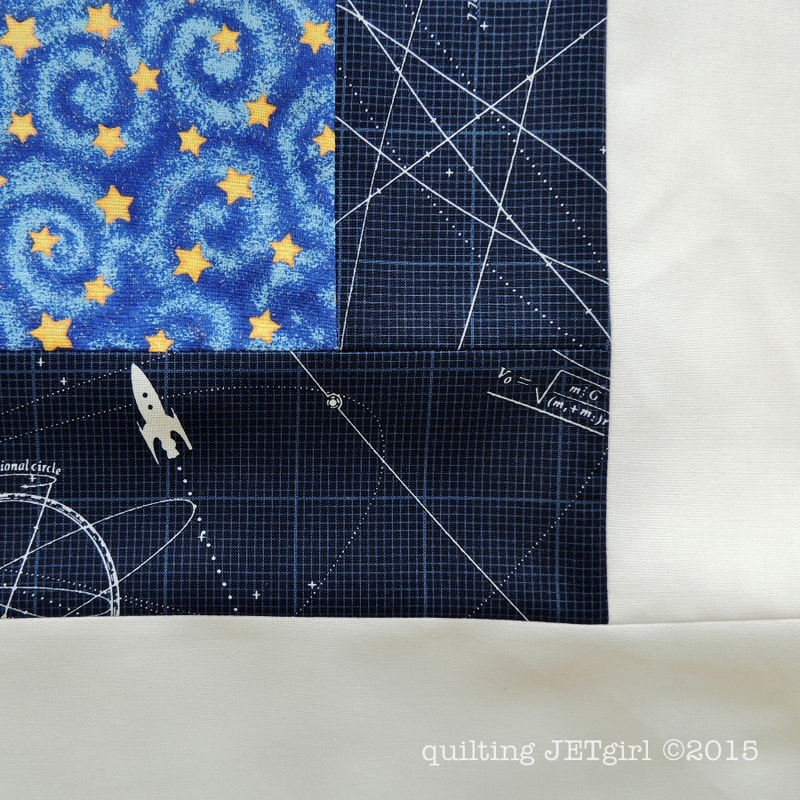 The rocket print is great, and it looks awesome in the block. I, too, wondered if we would end up cutting the block. It’s so big in comparison to the other blocks we’ve made. Ooh, so pretty! I can’t wait to start on mine — hopefully after I get back from my trip next Wednesday! Your block is great, the quilt will be awesome. Neat! I love how the dark fabric looks in strips. You couldn’t have picked the perfect fabric ~ it is like Riley Blake designed it with you in mind! Love your fabric choices. This is going to be a gorgeous quilt. I really like the contrast between the white and the navy rocket age. Very nice! Gack! I haven’t even contemplated cutting the blocks up. I really like the big blocks. It is interesting to think about how things may come together. Those teeny rockets jetting around the blocks are just brilliant! And yes, not knowing the layout would be driving me potty!